SEO should be the topmost priority of every website/blog owner, if not they better think about. With constant updates to Google’s algorithms, not to mention their “crack down” on various SEO techniques, business owners and SEO experts are continually being expected to refine their SEO skills and practices to meet the changing demands of Google. When it comes to beginning an SEO campaign, there are many factors to take into account if you’re to show up as favourable in search engine eyes and for this reason, every website owner and SEO expert out there should be familiar with both ‘white hat’ and ‘black hat’ SEO. There are many definitions of counts as “white hat” SEO, but the majority of opinions boil down to following: White Hat SEO is a practice where honest and valuable content is created, for the purposes of adding value to a user’s experience, rather than simply looking for ways to produce higher rankings. While certain ‘ranking’ techniques can be used in the creation and marketing of website and blogging content, the focus should be on quality and not on search engine manipulation. This includes using relevant and organic keywords, avoiding keyword stuffing and using keywords naturally in their correct contexts, keeping links organic, producing well-written and informative content, participating in online communities and using social media. If you approach an SEO consultant or an SEO agency, for example, they will (if they’re trustworthy) use white hat SEO practices to build your rankings. However, with Google’s constantly changing algorithms, anyone engaging in search engine optimisation to build their rankings should also be aware of what’s being targeted and reprimanded by Google (and also what’s being rewarded). With the latest Penguin update, for instance, released in April this year, many websites using ‘white hat’ techniques saw their rankings drop significantly, mostly due to over-usage of exact match anchor text linking. While some businesses weren’t necessarily trying to do the wrong thing, they still found themselves targeted by Google. Exact-match anchor text linking, of course, is still considered a white hat technique, but too much of it is not deemed as genuine by Google, since the focus is creating links here, rather than producing great content. 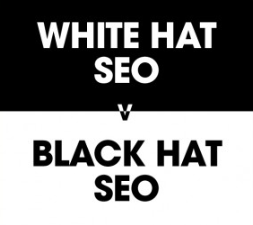 Alternatively, “black hat” SEO commonly falls into the category of “cheating.” Black hat techniques are essentially techniques that are employed to deliberately manipulate or find “loop holes” in search engine algorithms, with the purpose of achieving higher rankings in SERPs. Often, these sites do not produce quality content for users and instead concentrate on influencing ranking algorithms. As you may have guessed, Google does not like this and penalises sites heavily for too much SEO, even banishing some sites from their search engine. So how do you know if you’re employing black hat SEO practices? Black hat SEO generally refers to strategies that involve link farming or ‘buying’ backlinks, producing poor quality content for the purposes of creating links or keywords, keyword ‘stuffing’ or deliberately using many keywords to influence rankings and using hidden text and cloaking. When searching for a reputable SEO agency, beware of promises to get you to the top of Google rankings in a short amount of time or guarantees a large amount of links. Ensure you scrutinise the techniques the company intends to use; in the past, Google has penalised certain businesses for ‘illegal’ search engine manipulations, even though they weren’t aware their SEO consultant was engaging in black hat practices. The responsibility is on you! Abhishek is an MBA from one of the leading Indian college. He possess more than 4 years of SEO experience and offers SEO services to clients around the world. He likes photography and exploring nature in his spare time.